Are you ready to sign up? When Jessica Farris stumbles upon an opportunity to get paid to participate in a psychology study conducted by the mysterious Dr. Shields, she jumps at the chance to earn some much needed extra money. All she has to do is answer a few questions, collect her payment, and be done with it. But when the questions become more personal and intense, and Jess is placed in scenarios rather than just answering questions on a computer, she feels that Dr. Shields is playing a game with her—it appears the good doctor knows what she is thinking and what she is hiding. Jess becomes increasingly paranoid, especially when she realizes she is caught in a trap of jealousy and deception. Who can she really trust in this modern game of cat and mouse? 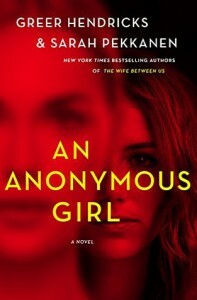 Can I tell you that I loved An Anonymous Girl just as much as The Wife Between Us? Gah! Greer and Pekkanen are incredible writers—they set the stage and then peel back the curtain to reveal some surprising twists. This story is not as shocking as The Wife Between Us, instead what happens is that the plot blindsides the reader because they are so captivated by the fantastic writing. These ladies could teach a master class for this genre, they're THAT good. They manipulate you into believing their characters, but in fact, you can't trust any of them. They also make you doubt your own conclusions. Brilliant!